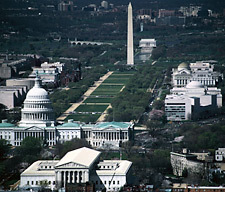 NEW in 2012: The National Coalition to Save Our Mall will exhibit our visions for the 3rd Century Mall at the Annual Meeting of the American Institute of Architects in Washington, DC as well as other venues. 3rd Century Mall: A Vision for the National Mall"
NEW: 2008: In December 2008, the National Coalition to Save Our Mall published "Rethinking The National Mall," a report and call to action that is the culmination of the past 4 years of work on the 3rd Century Initiative. reports at the Coalition's main website. What does the Mall need? Read in the July 2006 issue of WASHINGTONIAN magazine (PDF, 944k) the article by Washington architect Arthur Cotton Moore, "A New National Mall for the 21st Century"
Watch the fast-paced, informative video The Future of The National Mall. Click here to go to the video. You will learn the Mall's history, its problems and needs, and our proposed solutions for a 3rd Century Mall. See what excited the enthusiastic support of The Washington Post and The Weekly Standard. Who else has seen it? Congressional members and staff, the media, National Park Service officials, Smithsonian officials and staff, DC parks and planning staff, and citizen groups in the DC area. Visit our print map and interactive digital map of the National Mall. Click here to load the maps. As a public service, the Coalition has digitized the rare, out-of-print McMillan Commission Report of 1902 and maps that are the conceptual underpinnings of today's National Mall and Washington, D.C.'s park system. Click here to learn more about the Mall's history, historic plans, and cultural significance.